Bold and beautiful, this heartwarming pink and red arrangement is an elegant show of sympathy at the memorial service. • This feminine arrangement features hot pink roses, pink asiatic lilies, pink gladioli, hot pink carnations, pink larkspur, red ti leaves, Italian ruscus and lemon leaf. 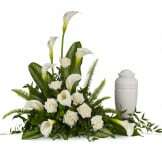 • Arrangement does not include urn. 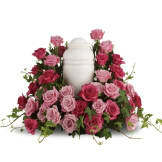 • Arrangement measures approximately 31 1/2" H X 27" W.
Flowers will be received by a Castlewood Funeral Home's staff. 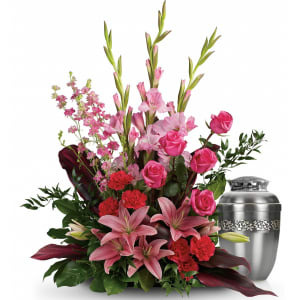 All of our flowers are designed and delivered by hand from a local florist in in Castlewood.